Recently, I attended a meeting at Landscape Ontario with the objective of creating financial benchmarks as guidelines for companies in our profession. This is a continuation of some earlier articles, where we discuss reviewing and benchmarking some simple financial ratios. As you’re reading, understand our goal is not to define a company as good or bad by simple benchmarks. The intent of these benchmarks, and these articles, is to provide a general framework for success for owners or managers who lack experience or understanding of their own numbers. The vast majority of us came from the trade, not from an accounting degree… so this is meant to guide, not to define wrong or right. Your field labour ratio is a great benchmark for comparing labour. Simply put, it’s the cost of your field staff wages (don’t include payroll taxes, just the wage) divided by your total sales. The result is your field labour ratio. One of the biggest problems with benchmarking your labour ratio is that we each have different interpretations of which wages to use. Take field labour. On the surface it’s simple — field labour is your field crews. But what about supervisors or managers? What about delivery drivers? The best definition of field labour is people whose time you include when you estimate. When you’re estimating hours on a job, that’s how you recover the cost of wages for the people who are working on that job. Everyone else better be in your overhead, so their wages get recovered in your markups. Overhead should be used to track wages for people you don’t estimate. That way, you know your overhead markups recover all the costs of wages for the people who don’t get included when you estimate a job. 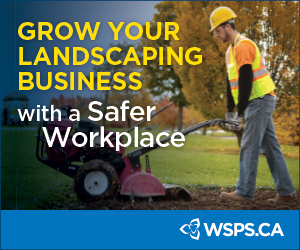 The average field labour ratio in the landscape industry is between 20 and 40 per cent of sales. If you are within that range, you are close to the industry average. Let’s narrow it down a bit, since 20-40 per cent is a big range. On average, profitable design/build/install companies spend 20-26 per cent of their sales on wages for field staff. 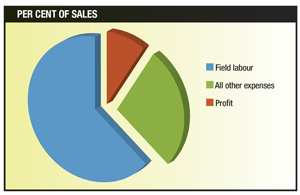 Profitable maintenance companies spend 33-40 per cent of their sales on wages for field staff. Companies that do a mix of work would fall somewhere in the middle. For instance, if your company does 50/50 install and maintenance, 30 per cent field labour is a reasonable target. Why the big difference? Materials. Design/build companies install, and therefore sell, a lot of materials. So the percentage they spend on labour is smaller, since the materials they sell as part of their jobs add to their revenue. Maintenance companies, on the other hand, install very little material. Their revenue really only comes from what they charge for labour and equipment. So labour expenses eat up a much higher percentage of revenue for maintenance companies. What if I’m spending less than the benchmarks on field labour? You do a lot of work with equipment (e.g. better productivity). You sell a lot of expensive material that gets installed quickly. Spending less than average on labour ratio usually means your company is efficient and productive at earning revenue. If you have high turnover, it could also be a sign you could afford better staff … companies with high turnover are generally less efficient. What if I’m spending more than the benchmarks overhead expenses? First: Double-check the ‘field labour’ definition earlier in this article. Make sure you are including only people who you include when estimating. Equipment is older and breaks down often. Equipment is shared, so crews who don’t have the equipment do work by hand. Jobs are not planned well; materials are late or not available when needed. Too many deliveries or trips to vendors or back to the shop. You don’t have enough staff in overhead to oversee crews and jobs properly. Crews don’t know each job’s estimated hours, and don’t get updates on whether they are doing well or not so well. Too much unestimated or unbillable time; mistakes, cleanups, drive time, time to get out of the yard in the morning. If one thing makes or breaks a landscape company, it is labour. Well managed, on-time, efficient crews can produce great labour ratios and still earn a good living wage. But many companies struggle with the daily mistakes, oversights and lack of planning or data that is all too common in the landscape industry. In next month’s article, we take a look at ways companies are reducing their field labour ratios; not by cutting wages, but by building efficient, motivated crews who finish work 10-25 per cent faster than average companies. Mark Bradley is CEO of TBG Landscape and LMN, based in Ontario. The objective of this article is give general guidance on common financial numbers specific to the landscape industry. It is not intended as professional financial advice. No LMN user data was analyzed or used for this article; financial benchmarks are gathered from industry surveys and one-on-one experiences with thousands of landscape contractors across North America.